I also have decided to keep tapping away at Love the Kitchen (for a while I was seriously thinking of having to retire it due to other commitments) – I thoroughly enjoy it, I really do, but am, from tomorrow, starting a new job and for the first month at least will have limited opportunity to conjure up some recipes or new posts. I will try. Without wanting to sound repetitive, I will not regurgitate my ramblings on why I love making bread, and how it is so much better than something store-bought. 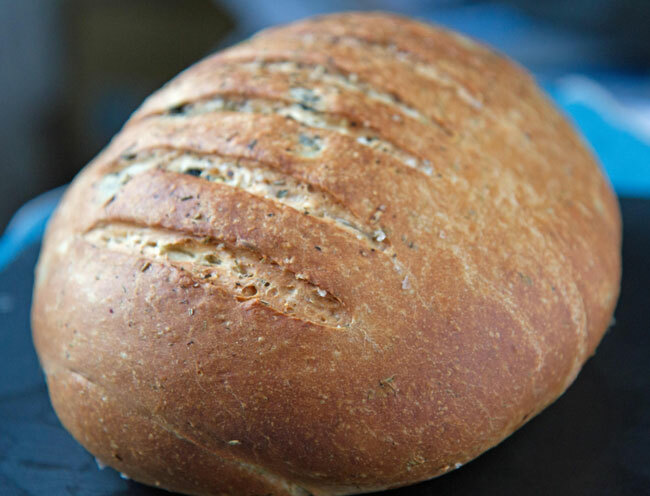 I would encourage you to have a look at some of my existing recipes, notably: Onion, Red Chilli, and Black Olive Bread; Sun-dried tomato bread with oregano and sea salt crust, and Black onion seed and sesame bread. 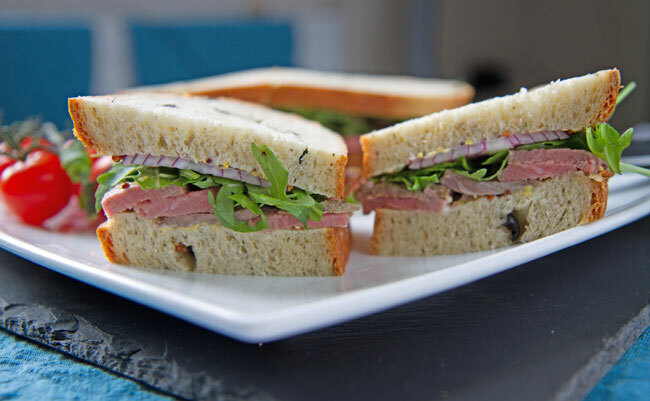 What better way to enjoy than with rare roast beef, Dijon mustard, rocket and red onion? Over Christmas, I wanted to make a variation of this and wanted (for once) to aim for simplicity. Having toyed considerably with many different types, I wanted to come up with something so basic and quick to make (aside from proofing – that stage is sadly unavoidable) – but also a versatile savoury loaf – and though ‘black olives and herb bread’. I have made this 3 times in the past 10 days – I am now officially hooked on it. I first made it for my guests who were with me over Christmas – and am yet to bore of it. Whilst I shouldn’t, I love to cut off a chunk as soon as it leaves the oven and dip in a little olive oil and balsamic vinegar… trying not to devour the loaf has been my issue. For those who have sampled it – 8 and counting – the feedback has been really positive. Combine all the dry ingredients (flour, yeast, salt, Herbes de Provence,oregano and sugar) in a large mixing bowl, and mix thoroughly using a bell whisk. In a measuring jug, add warm (from the tap) water to the 275ml line. Then, create a well in the middle of the dry mixture and slowly pour in the water, followed by 3 tbsp olive oil. Using a silicone spatula or wooden spoon, start to fold the dry ingredients into the liquid and keep folding together until a dough ball is formed. You may at this stage find it easier to switch your your hands, or a hybrid hand and utensil approach which means that the dry and wet ingredients are being evenly distributed. Remove the dough from the mixing bowl, and knead for 5 minutes or so until the texture is no longer sticky, yet still elastic. You may need to sprinkle additional flour during this process, so keep some at hand. I use a silicone baking mat to knead on and do not need additional flour. Oil the same mixing bowl (saves washing up) with a small amount of olive oil, then return kneaded dough ball, cover with a tea towel or cling film for 1 hour, and allow to rise in a warm place. Meanwhile, drain the black pitted olives, cut in half horizontally, then each into thirds. Remove excess moisture using kitchen paper and squeeze out as much liquid as possible. The dough should have doubled in size (maybe a little more). Remove the dough and flatten into a large oval. Then, evenly sprinkle the black olives pieces and gently press into the dough. Next tightly roll the dough from one side to another into a swiss-roll shape, then fold the narrower sides towards the centre. Manipulate the dough into an oval shape and place onto a silicone backing sheet. Flatted the loaf, score with a sharp knife into shallow diagonal lines. Cover again with a tea towel, and allow to rise prove for a further hour in a warm place. Gently brush or spray olive oil over the top. Then, sprinkle on top a combination of sea salt (my favourite is Gros Sel de Guérande) - a natural coarse grey sea salt) and Herbes de Provence, and gently press them into the top of the dough with the palm of your hand. Bake in the oven for 30 mins. Once cooked, tun onto a wire rack and allow to cool. If you want to maintain an even softer crust, cover with a tea towel whilst the loaf cools down. Due to the nature of ovens been quite poor at providing a consistent temperature throughout, I often rotate the oven tray 180 degrees half-way through cooking (15 minutes). Scoffed a whole loaf of this lovely bread in less than a week! Great on its own, with butter, or to mop up the day’s stew.